Wellington, 7 April 2016 – An exceptional new commercial property has come up for sale on the corner of Cuba and Dixon streets. 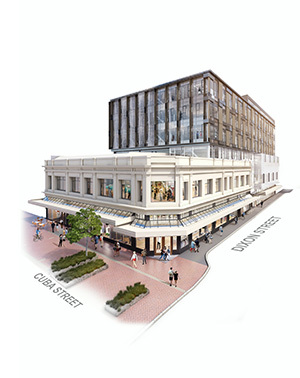 The development, being marketed as the Cuba Dixon Precinct, is already fully leased with a government-funded tenant taking a 21-year lease across the six levels of commercial space and three nationally recognised retailers taking seven and eight year leases on the ground floor retail spaces. Marketed by Matthew St Amand and Bill Leckie of CBRE New Zealand on behalf of developers Willis Bond & Co, expressions of interest in the six-storey freehold property are requested by 4pm on Thursday 5 May 2016. Matthew St Amand, Managing Director of CBRE Wellington, describes this as “an extraordinary opportunity to purchase a brand new freehold investment asset of the highest quality. “The Cuba Dixon Precinct really has it all: a brand new building, superb location, quality tenants on exceptional covenants, secure income and guaranteed rental growth. It is set to become the hub of a thriving new student community. Developed by Willis Bond & Co, designed by Athfield Architects Ltd and constructed to the highest standards by LT McGuinness Ltd, the new six-storey mixed-use building is one of a very small number of new, high-quality commercial assets in the Wellington market. The building offers 9,200sqm of versatile commercial space across six levels, plus 745sqm of premium ground floor retail space. 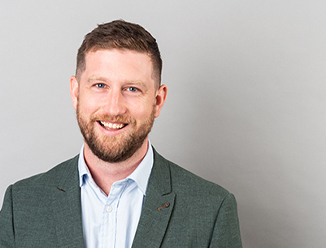 Designed to be 100% compliant with current code requirements for an Importance Level 3 building – effectively equivalent to 130% of the seismic performance requirements for a typical office building – the development’s design allows long-term flexibility of use, says Bill Leckie. The Cuba Dixon Precinct is located in the heart of Wellington’s renowned Cuba Quarter. As one of the capital’s top footfall pedestrian zones, it is an increasingly sought-after location for retail and business use. As a result the precinct is undergoing rapid change, says Leckie. “Centrally located between the city’s two major universities, the Cuba Dixon Precinct is set to become an important new tertiary hub for over 1,000 students and faculty when the Whitireia WelTec campus opens in the building in 2018. In addition to the confirmed 21-year net lease for the building’s entire commercial space, the five retail spaces have been leased to three quality retail tenants. Leading menswear fashion brand Barkers Clothing Ltd has taken a seven-year lease on the prominent corner unit. Cotton On Clothing (New Zealand) Ltd has taken an eight year lease on units two, three and four and a communications company has agreed terms for an eight year lease on unit five. The rent commencement date is anticipated as 1 November 2017 for the commercial tenant and late 2016 for retail tenants. Both the commercial and retail rentals are indexed by fixed annual growth.